Many of the calls and deaths are overdoses. PHOENIX — Fighting fentanyl has become one of the primary tasks for first responders across Arizona. Every day firefighters across the Valley are administering the life-saving drug, Naloxone, also known by its brand name, Narcan. "We are just up to our shoulders in these calls, before we were down by our ankles," said Captain Rob McDade with the Phoenix Fire Department. At Phoenix Fire Station 18 the garage is often empty. It is nicknamed 'The Lightshow' because of how often the trucks are rushing to calls with lights and sirens. "We go on a lot of calls here," said Captain McDade. "A dead body is once a shift," said J.J. Fowlie, a firefighter on station 18's B-shift. "We are running on several of those of shift, where we are pushing out Narcan three or four times a shift," said Fowlie. Not only are they using Narcan more often, but also in higher doses. "There have been a couple of times where we gave all the Narcan on the truck," said Captain Grant Pepping, who oversees the B-shift squad at 18. "In the old days they would say [2-4 doses] would wake up an elephant, but [now] we’re not bringing them up. So that tells us that the potency and the amount that they are taking is just off the charts, astronomical," said Captain McDade. The potency comes primarily from the Fentanyl. Fentanyl is a synthetic opioid roughly 100 times stronger than morphine. 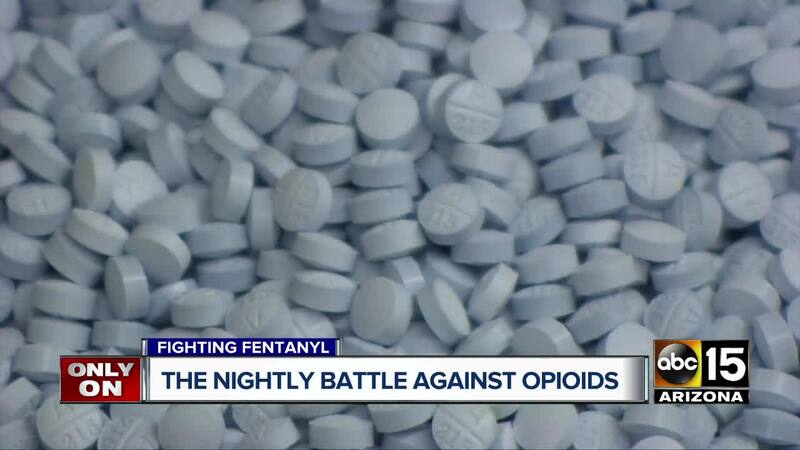 Pharmaceutical Fentanyl was developed for pain management treatment of cancer patients, applied in a patch on the skin, according to the DEA. In more recent years, Fentanyl has been increasingly added to heroin to increase its potency. "We have seen our Fentanyl deaths double each year since 2016," said Dr. Jeffrey Johnston, Chief Medical Examiner for Maricopa County. Fentanyl is the fourth deadliest drug in Arizona, according to the Arizona Department of Health Services. It was found in 29% of all overdoses last year. In December alone 75 Arizonans died because of opioids. "Who is overdosing? Everybody," said Captain Pepping. "The young, the teenage, young professionals, the older generation," said Captain McDade. "It seems like nobody is safe from this crisis." Just last week, two Scottsdale teens overdosed after buying pills from a classmate . The pills had Fentanyl in them. Chief Medical Examiner Dr. Johnston says people buying mislabeled or unknown pills is a common, deadly mistake. "They are stamped like oxycodone, but instead it is Fentanyl, which is much much more potent. So it really changes the dynamic a lot," said Dr. Johnston. One thing that is not changing is the hectic pace of Station 18, working non-stop to combat a crisis that has no end in sight. "We are swimming in it right now, going on [overdoses] more, seeing it more. And it’s sad, we all live in this community," said Captain McDade. Firefighters say opioids are not just showing up in overdose calls. They tell ABC15 that people are high during car crashes and are getting hit crossing the street while on heroin. In 2017, EMS personnel administered 9,235 doses of Naloxone. Since June 15, 2017, the AZDHS reports 2,384 suspected opioid deaths and 17,492 suspected overdoses. Roughly 62 percent of all overdoses are men, and the majority are 25-34 years old. To learn more about the opioid crisis in Arizona and how the state is working to combat it, check out the AZDHS website .